So, in preparation for the wedding, I’ve got my own “beauty plan”. Most brides do – you want to make sure you look for very best for your Big Day. That’s why you schedule routine facials, hair treatments, and cosmetic surgery. Wait, what? Yes, I know it sounds dramatic. And yes, I know I don’t look like a complete ogre and to most people, I don’t “need” to do this. But this is something that I am very self-conscious about. It’s something that no amount of diet or exercise or creams or injections have been able to get rid of. What is it? My tiny bewbs? My not-so-flat belly? Certainly not my ample derriere AKA best asset (pun intended). Yes, I have a folder full of pics like this. I’ve tried almost everything. I had this tiny double chin exercise equipment that could supposedly “exercise” my double chin away. I have done Thermage – basically a skin-firming procedure where you “iron” the skin which could supposedly make my double chin less obvious. I have done mesotherapy – a series of injections which could supposedly shrink the fat cells in the double chin. NONE of them worked. Not even a bit! It may work for some, but certainly not me. And that is why I went to Dr Alice Prethima Michael of Dr Alice Medispa in Bangsar (Kuala Lumpur, Malaysia) to inquire about what I can do to really get rid of that fat permanently. I’d done some research online, and I knew that liposuction was an option. But I was a little scared about what it entailed – wouldn’t it damage the surrounding tissue? And wouldn’t that require more time to completely heal? Fortunately, Dr Alice knows all the latest and greatest in cosmetic procedures and is one of the very best cosmetic surgeons in Malaysia, and she told me about Vaser LipoSelection. 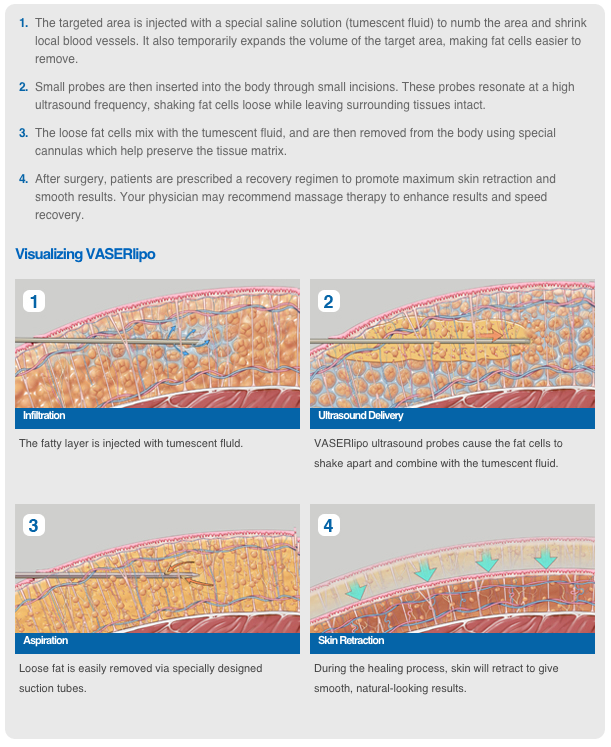 So what makes Vaser LipoSelection different from traditional Liposuction? According to my research, Vaser LipoSelection is more highly selective in targeting and liquefying the fat, minimizing risks of injury to the blood vessels and nerves. This selectivity for liquefying the fat cells means less tearing and injury to surrounding tissue, resulting in less bleeding, bruising and pain. "This is why it can be done without GA or major bruising," according to Dr Alice, "Blood vessels and lymphatic circulation/channels remain intact, so there is also faster relief in terms of swelling." According to the VASERlipo website, VASERlipo™ “produces superior results by treating areas of fat with ultrasound energy, then gently removing the fat through a small tube inserted under the skin. This minimally invasive process is gentle on the body and supremely effective, giving patients the smooth contours they want with far less pain or recovery than traditional liposuction”. That’s why I chose to do Double Chin Vaser LipoSelection! It’s pretty exciting for me, as my double chin has always put a damper on my confidence, to the point where I dislike people taking close-up photos of me for fear of getting the wrong angles. I know a lot of people share this feeling, and I feel very fortunate to be able to do something about it, thanks to Dr Alice Michael!